These are the gadgets that have been bodily hurled from the ugly tree, then thrashed repeatedly with the ugly stick. The kit that should have been drowned at birth. The gear that only a mother could love. You get the picture. Monstrosities to the naked tech eye, we've rounded up the worst offenders in all their collective unattractiveness. More or less up to the Amiga 2000, computers had personality. After it, with the PC dominant, we were treated to an uninterrupted decade of beige until the iMac. The iMac could be a right pain to use; that it was greeted like the arrival of bananas and rock 'n' roll records after the post-War austerity years is testament to how unendingly drab and awful said PCs had been. A random heap of buttons vomited onto a malevolent little hump, topped by a viewscreen that recalled both 1984, the dystopian novel and 1984, the last year this kind of design might conceivably have been deemed acceptable. To integrate a wide screen, Apple's usually reliable designers came up with something that looked like the previous - and subsequent - Nano had been squashed in some horrific accident. Poor show. Grotesquely oversized, overpriced phone that makes you look like you're talking into a wedge of black electronic cheese. There they sit, the unlucky ones. The Maplin gadgets, like sad animals in a particularly cruel research lab, are the experiments that never made it - the attempted MP3 players that'll never be an iPod... the home security equipment that Argos rejected as "too dowdy"... the USB hard disk enclosures. Everything from the off-white plastic of their bodies to the fading, poorly printed labels, seems to whisper, "Please kill me." 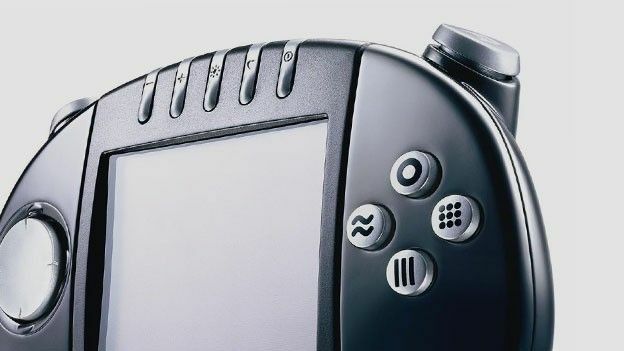 Hilarious abortion of a console that looked like a post-apocalyptic Game Gear, yet fell apart if you so much as looked at it. Very British. Comprising two pre-amps, a power amp and CD player, this is perhaps the ultimate in charmless power-audiophilia. Only slightly smaller and lighter than Stonehenge, it's done up in a vile, "satin-gold" finish, festooned with peak meters and studded with buttons saying things like "Invert phase". It sounds like heaven on a stick, but visually, it's like having an 18-stone man in a gold tracksuit bound up to you and start shouting. The world of mobile phones went mad in the early noughties, and every bad design choice was incorporated into Nokia's gaming phone. Triangular buttons, an idiotic form factor and stupefyingly tedious colour palette? All present. Ug versus ugger. The first PS3 was a gauchely shiny, plastic-chrome-trimmed monstrosity that sucked dust and fingermarks to its bosom, topped by a "Spider-man" font that started to date horribly three seconds after it was applied. The original 360, meanwhile, resembled a brutalist 1960s tower block the colour of sick. Now recognised as by far the ugliest radio ever invented, the Bug was hailed by some on its release for its "distinctive" design. Its squat alien form was like a War of the Worlds robot dragged backwards through a cheap plastics factory.